ATLANTA – January 7, 2014 – In an action unprecedented in the history of Continental Scottish Presbyterianism, an American – Rev. 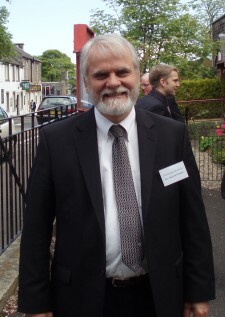 Warren Ewing Gardner, minister of Reformation Presbyterian Church in Atlanta, Georgia – was appointed as Moderator of the 2013 General Assembly of the Free Church of Scotland (Continuing). The General Assembly convened in Edinburgh, Scotland from May 20 through May 24, 2013. Rev. Gardner delivered the Moderator’s Address at the General Assembly on Tuesday, May 21, 2013, entitled, “The Challenge of Living in the Environs of Sodom” based on the Scripture text, Ezekiel 16:46-59. Born in Pittsburgh, Pennsylvania in 1946, Rev. Gardner studied at Westminster Theological Seminary in Philadelphia and Pittsburgh Theological Seminary, graduating with a Master of Divinity degree. In 1972 he was ordained to the Gospel ministry in the Presbyterian Church in the United States. After his ordination in 1972, Rev. Gardner served as Assistant Minister at First Presbyterian Church, Atlanta, Georgia, and at Rehoboth Presbyterian Church, Decatur, Georgia, before being called as pastor to First Presbyterian Church in Winder, Georgia. In 1981, Rev. Gardner was called as the organizing pastor and church planter of New Life Presbyterian Church in Winder, Georgia (Presbyterian Church in America) where he served as minister for twenty-three years. By 2003, Rev. Gardner had become convinced of the Scriptural basis of Free Church practice, and sought admission into the Free Church of Scotland (Continuing) as a church planter in Atlanta, Georgia. The congregation, founded in 2004 as Free Church Atlanta, and now known locally as Reformation Presbyterian Church, meets for worship at 925 Dogwood Road, Snellville, Georgia 30078, and follows the simple and reverent pattern of Biblical worship recovered in Scottish Reformation, with the elements and practices of the service prescribed only by the Word of God. The Free Church of Scotland (Continuing) is a Reformed and Presbyterian denomination that adheres in its doctrine and worship to the position adopted by the Church of Scotland at the Reformation, and codified in the Westminster Confession of Faith and the Larger and Shorter Catechisms. There are over 35 Free Church (Continuing) congregations throughout Scotland and North America, and missionary works in Zambia and Sri Lanka.